NEWEST LED LIGHT BULB FILAMENT TECHNOLOGY: These light bulbs are the true replacement for the standard incandescent light bulb. This is your best 60 Watt Incandescent Replacement Bulb. Use these indoor or outdoor in your lighting fixtures. With a light output of over 800 lumens, this LED filament light bulb replaces all your current energy wasting 60-watt incandescent bulbs. Using only 8 watts of power this bulb puts out the same light brightness as a 60-watt incandescent bulb. 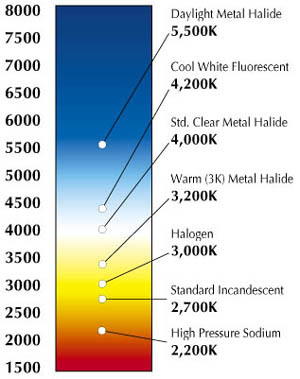 The LED Bulb is 2700K warm light which is also identical to your 60 Watt incandescent bulb. 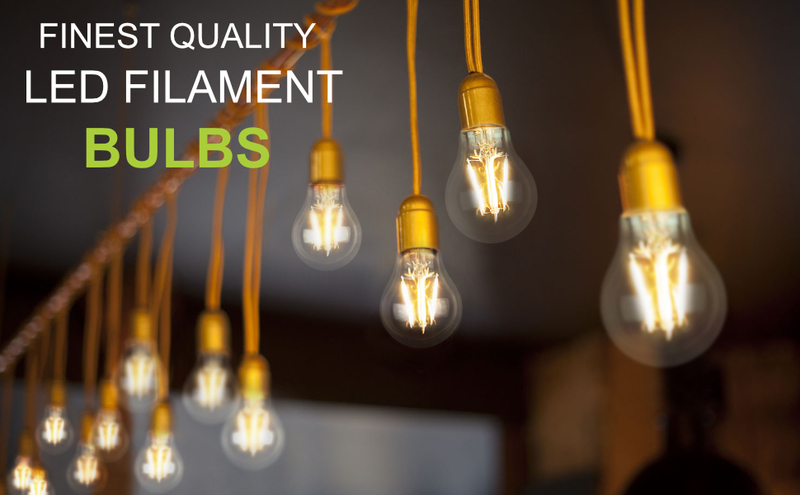 Replace all your standard E26 Medium base bulbs with this filament bulb and save over half the cost in electricity. These bulbs pay for themselves by saving you money on electricity. 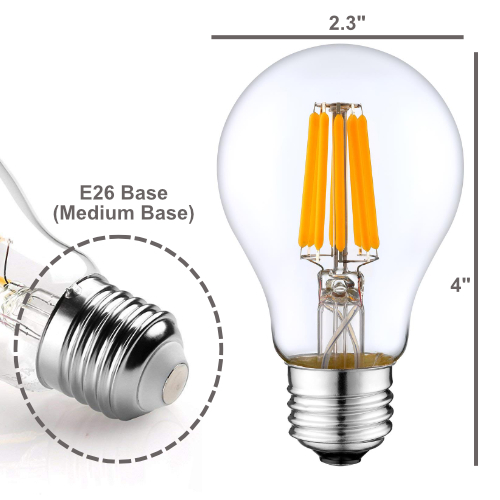 Energy Saving: This 8W LED filament bulb can easily replace 60W incandescent bulb, saving over 90% electricity, you can save up 11/dollars a year(base on 5hrs/day 11￠/kW.h). Long life reduces the hassle of replacing bulbs so often. Light Accents LED bulb average life is 30,000 hours, effectively reduces frequency of changing light bulbs, compare to standard incandescent light bulbs which last only about 1500 hours or less. The color rendering index(CRI) is the ability to restore color. 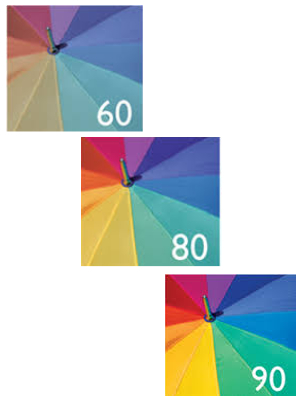 Daylight color rendering index is 100, incandescent lamp is 100, LED is 70-90. The lower the CRI, the more visually distorted the color. CRLight's LEDs CRI is all above 80 Ra. Our bulbs have better dimming capability then most LED bulbs. Smooth results when turning up and down. With an output color temperature of 2700K our bulbs look exactly like the 60 watt incandescent bulbs you are used to using. See what our customers are saying "Very impressed by the color and appearance of this bulb. Replaced 3 60W incandescent globes and now I'm getting brighter light for less than half the wattage of just one of the previous incandescent bulbs." This is the perfect 60 Watt Incandescent bulb replacement. Our New LED Filament bulb is designed to resemble a traditional Incandescent Bulb with visible filaments, for aesthetic and light distribution purposes. Clear glass protective shell around an LED filament core. 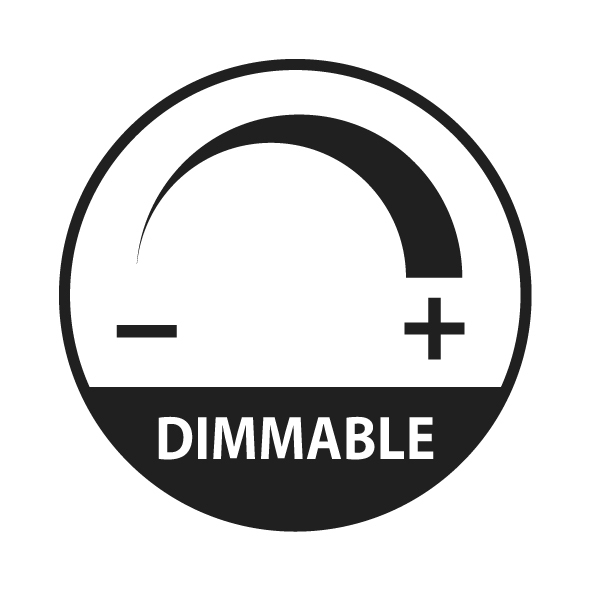 They are designed as drop-in replacements for conventional clear incandescent bulbs used in decorative light fixtures, such as table lamps, pendant lights, chandeliers, and bulb-based candelabras. They have the appearance of traditional incandescent bulbs but the higher efficiency of light emitting diodes (LEDs).